Today I come bearing the news of imminent arrival of the GTX 1060. NVIDIA has announced this GPU will be available on July 19th, starting at an MSRP of $249 (Founders Edition $299). Performance is being compared to the GTX 980 which, at the price and power (120 W), is quite a solid graphics card! Notably missing from this list of features is support for SLI. 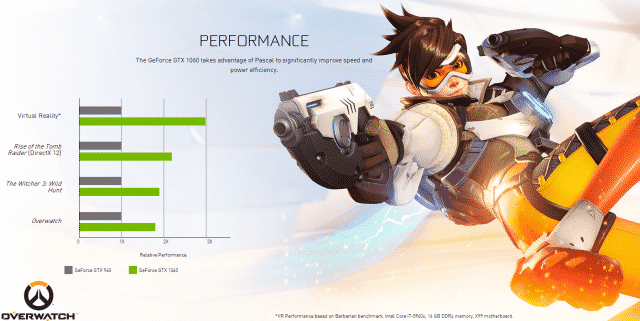 The GeForce GTX 1060 takes advantage of Pascal to significantly improve speed and power efficiency. Keep an eye out on our front page for a release day review! The projected specs look pretty good, especially considering the low price. I highly doubt we will see 399. I could imagine 350 for the higher end cards. Most I'd bet will be around 300. Reference cards will be ~$250, reference w/ a cooler (e.g. EVGA ACX) will be ~$260-270, custom PCB cards (e.g. EVGA FTW, ASUS Strix, etc) will be ~$280-300. There will be a select few, as there always are, pulling almost 1070 prices. Hello Overclockers.com account that wasnt online for about 10 years! Why did they disable SLI for the GTX 1060? They allowed it for the GTX 960. My guess is for something that rhymes with honey. Although I agree with you, I'm a bit surprised as well. Probably because it would take sales from more expensive cards, provided the 1060 prices behave. The track record on that is, well, not good. starting to think the rumored 3gb model is a cutdown 1060 that will be marketed as a 1050, which imo will compete price-wise head to head with the RX480 and probably have similar performance. That would make sense as lower models are sometimes cut back higher models. But they aren't going to call it a 1050 with ONLY cutting back on the vRAM. There will be cut down cuda cores/rops/tmu's, etc. thats what i was implying. Meant "cutdown 1060" as everything on it would be cutdown, pretty much. A few pieces of leaked performance for your viewing pleasure! just came here to post that, beaten to the punch. Not exactly sure those sorts of numbers beat a 980 though? The comments on the post here http://videocardz.com/62122/nvidia-geforce-gtx-1060-official-performance-leaked mention alot of tomfoolery going on with the numbers, at least it seems that way to them. Who knows. The commenters make some pretty good points, and several back them up. It's uncommon for everyone to call BS. Even NV fanboys are a no show. Wow. Looking at nvidia early slides and comparison to GTX980, GTX1060 should be about as fast as GTX1070 :p ... but really it should be at least slightly faster than RX480 as I doubt it will be slower than GTX970. I'm not sure if 25% faster than RX480 isn't too much but 10% can be real. We will find out in couple of days. Looks like in this DX12 benchmark, its basically neck and neck with the RX480. its almost exactly as a i figured, the way it would be cutdown. Honestly they should rename it the 1050 since it seems like they are sticking with 1060, but its early and its a leak/rumor at this point so it remains to be seen.